INTRODUCTION: The most common reason for conversion in bariatric surgery is hepatomegaly due to inadequate exposure of the proximal stomach. This study utilizes a novel bariatric supplement in conjunction with a calorie restricted diet to reduce liver volume pre-operatively. METHODS: A consecutive series of morbidly obese patients were recruited for this trial at an urban tertiary referral center. Each patient consumed a novel bariatric product called Nuvista® for 4 weeks pre-operatively. Nuvista® is a high protein, low fat powder fortified with vitamins and minerals and was ingested twice a day as part of a 1200-1500 calorie diet. At the start of the trial, each patient completed baseline demographics, blood work, urine ketone analysis, liver ultrasound of the left lateral segment, and multiple questionnaires. At the time of surgery, these studies were repeated for comparison. Data was analyzed using a paired t-test for continuous variables. Bivariate analysis was used to correlate changes in liver volume with changes in body mass index (BMI) and weight. Factors that predicted greater changes in liver volume were calculated with linear regression. A p<0.05 was considered significant. Twenty-one consecutive morbidly obese patients participated in the trial prior to a Roux-en-Y bypass or an adjustable gastric band. The cohort consisted of 17 females with a mean pre-operative weight and BMI of 122.7 ±15.9kg and 44.5 ±3.9, respectively. Mean pre-operative liver volume of the left lateral segment was 562.5 ±291.3cm3. After 4 weeks of Nuvista®, the mean weight and BMI decreased significantly to 118.9 ±15.5kg and 43.1 ±3.4, respectively (p<0.001). The mean liver volume of the left lateral segment after 4 weeks was significantly reduced to 299.9 ±162.1cm3 (p<0.001). 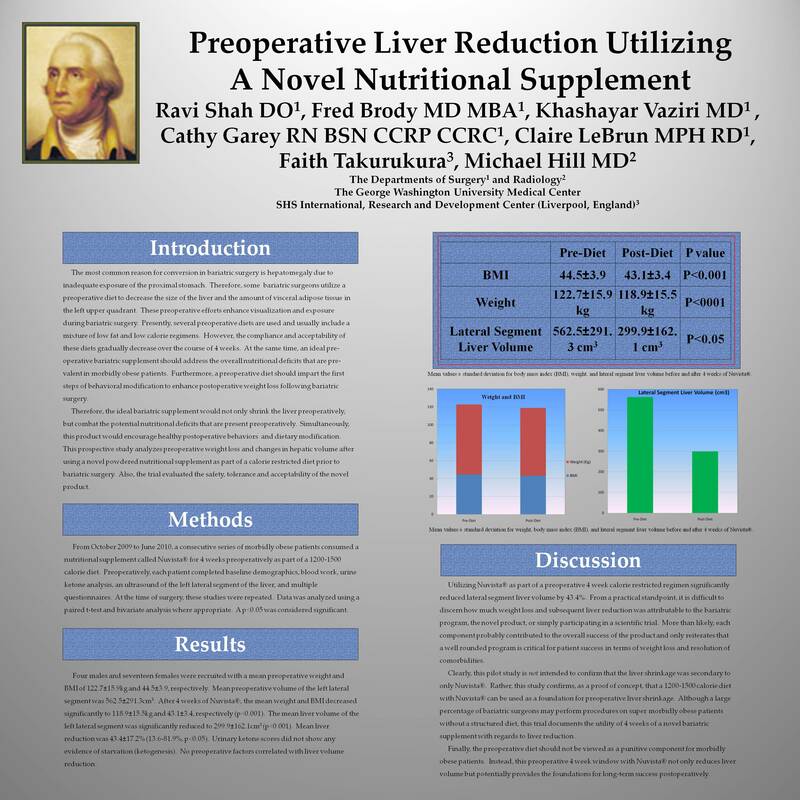 The percent mean liver reduction for the entire cohort was 43.4 ±17.2% (13.6-81.9%, p<0.05). Questionnaires showed that Nuvista® was acceptable in terms of taste with no impact on gastrointestinal symptoms and stool character or number. Urinary ketone scores did not show any evidence of starvation. Of note, there were no conversions to open laparotomy. No significant correlation was found between liver volume reduction, initial weight, BMI, or liver volume. Utilizing Nuvista® as part of a pre-operative 4 week regimen significantly reduced lateral segment liver volume by 43.4%. Based on the urinary ketone scores and questionnaires, patients were able to successfully comply with this type of diet over a 4 week period without evidence of starvation. This type of pre-operative regimen not only enhances surgical exposure but incorporates healthy behavioral changes that are necessary to sustain long-term weight loss.